Perhaps the MacBook should adopt split-screen multitasking instead of floating windows. Many people want their iPad to work more like a MacBook. A concept video proposes the opposite: having macOS function more like iOS on a tablet. That means no more free-floating windows. The designer believes this will make it easier to work with applications. “There is no need to close or minimize an app. And no need for the traffic light buttons. Simply swipe between apps and swipe up to go to the springboard. Just like on the iPad,” said Weinreich. He suggests a series of finger gestures to easily control what’s displayed in screen, just as on the iPad. Clearly for Weinreich’s idea to be really practical Apple would have to make a touchscreen MacBook, something the company has shown no interest in doing. 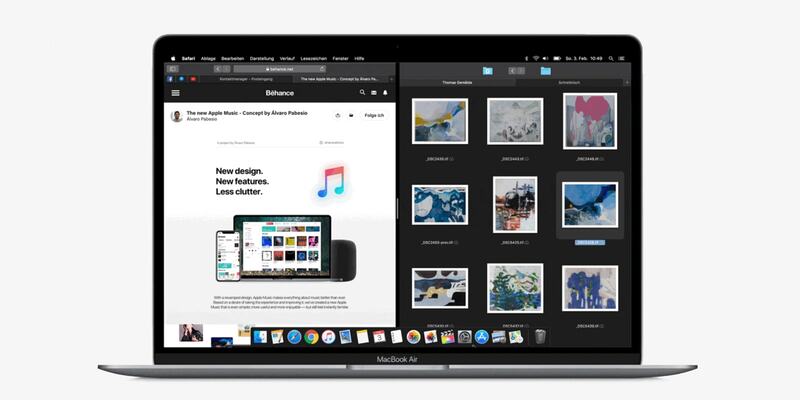 Still, the designer points out that one of the advantages of his simplified macOS windows management system would be MacBooks and iPads using very similar interfaces. Weinreich recommends the system be modified for larger screens. Users would be able to open more application windows, and resize them, but they’d never overlap each other. Doubtless, any number of Mac users are frothing at the mouth at the suggestion of giving up free-floating windows. And it’s extremely unlikely to be adopted. But the role of artists’ concepts like this one is to ask “What if?” questions, which is almost always a valuable exercise. Just because macOS has used free-floating windows since the 1980s doesn’t automatically mean it’s the best system. And there’s no chance Apple can ever improve if it never questions long-held beliefs. Microsoft added something similar to Windows when it unveiled the Surface line of tablets. But Microsoft made it optional, giving uses the choice between traditional free-floating Windows and split-screen multitasking. Perhaps Apple could do something similar.